Pioneers in the industry, we offer poe refrigeration oils from India. 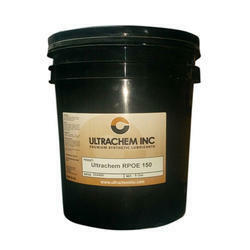 Ultrachem RPOE Series are fully synthetic lubricants based on high performance polyol ester (POE) technology. This series has been designed specifically for use in demanding refrigeration systems and is compatible with both HCFC and HFC refrigerants including R-i34a. These lubricants are available in a range of ISO 22 to ISO 220.